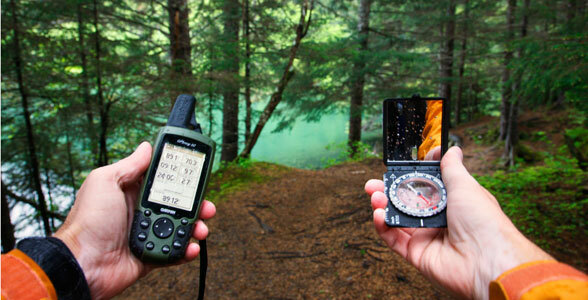 Compass vs GPS, Which is best? Which is Better – Compass or GPS? The compass is a simple but effective navigational tool that has been in use for centuries. Countless explorers and adventurers have relied on the compass for directions. Now it seems that new technology in the form of the GPS device is replacing this humble tool. Millions of portable GPS units have been sold for car and boat navigation and many cell phones now include a GPS capability. GPS devices are quickly becoming the new universal tool for navigation. Is a GPS device a good replacement for a map and compass when hiking and backpacking? It pays to do a head-to-head comparison before abandoning your compass. A compass is a light, portable tool that accomplishes one function – it indicates the direction of magnetic north. It’s inexpensive (a compass in a sturdy case can be purchased for less than $20) and doesn’t require a power source. A compass is not difficult to use, though some training and practice are required. With a map and a little skill, a compass is perfect for back country orientation. How can a compass help you if you’re lost? If you’re completely disoriented and without a map, a compass can’t do much more than tell you which way is north. A compass is useful only when you’re prepared to use it correctly. It’s most useful when used with a topographical map. It doesn’t take long to learn how to use a compass. There are good websites that walk you through it, including Kjetil Kjernsmo’s Illustrated Guide on How to use a Compass and several Boy Scouts of America guides such as this one on How to Use a Compass. A GPS device is a receiver for the Global Positioning System, a network of two dozen satellites that orbit the earth. The system was originally developed for use by the U.S. military but is now available to everyone. A GPS receiver use signals from this satellite network to compute its own location. In addition to telling you where you are in terms of longitude, latitude and altitude, a GPS device can track your movement. A GPS device can store a large number of maps and show you your position in real time on a map. The GPS’s ability to show your path on a map is the electronic equivalent of a map and compass. You also have to learn how to use a GPS device, but once you do it is superior in many ways to a traditional compass. The electronic compass that’s built into a GPS is easier to use and can be consulted as you walk. Are there any disadvantages to a GPS? In order for it to work, it has to be able to pick up a satellite signal. Trees and even clouds can block a signal, rendering the GPS inoperable. Another disadvantage is that a GPS is an electronic device that requires batteries to work and can malfunction. When you use it in the wild you have to be careful not to drop it or let it get wet. Finally, GPS devices are expensive and are not accessible to everyone. There’s no doubt that a GPS loaded with a good topographical map is easier and faster to use than an old-fashioned compass. A GPS can provide vital information when you’re traveling through the backcountry, telling you where you’ve been, where you are and where you’re going. But the disadvantages of the GPS device are serious ones. The chances of it losing its signal, breaking or running out of power are so great that you should not use it as your sole means of orientation. When your survival is at stake, a map and compass are indispensable. These two items should be part of the essential items that every backpacker or hiker brings on every outing. Each member of a backcountry hiking party should know how to orient with map and compass. The bottom line is that a GPS device is great for driving navigation and is a fun gadget to bring along on a hike or backpack — but it must be backed up by a map and compass. Before going on a trek in the backcountry, get a topographical map, study it and brush up on your compass skills. Then you can still bring a GPS and enjoy all its great features. There are many types of GPS devices on the market with specific uses, including driving, boating, cycling and hiking. If you plan to use a GPS for hiking, make sure your unit works with standard USGS Topographic Maps.